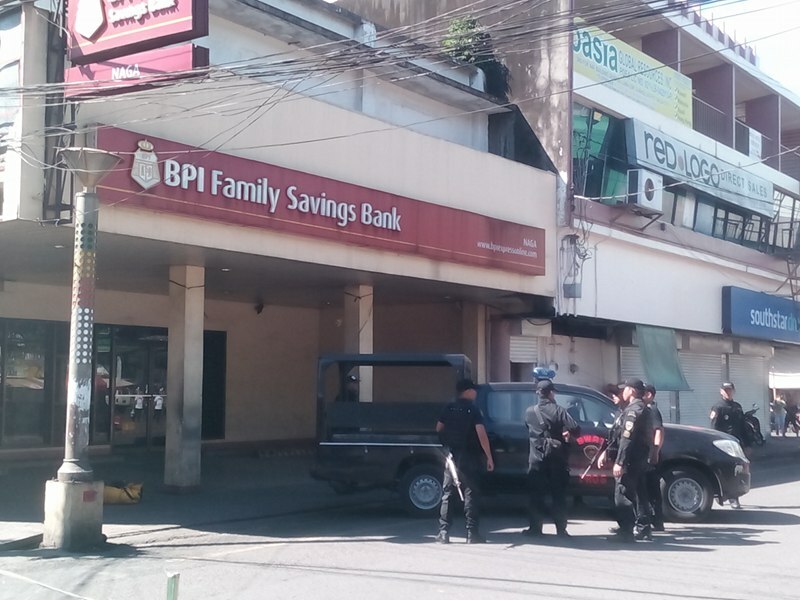 NAGA CITY 12/10/16 (Bicol Standard) — A bomb sniffing dog together with a team of bomb experts were sent to the BPI branch at Evangelista St., at 8:30 a.m. today to secure the place where a bag was left unattended that had caused serious alarm. PSrSupt. Julius Munez, told the BICOL STANDARD that he received a call from the bank manager regarding the said bag, which appears to contain suspicious contents, which was why he ordered that the place be immediately secured. “When the bomb sniffing dog reached the place, it immediately sat upon the bag,” Muñez said. “That is reason why the bag was wrapped and placed in a bullet mat container — to be sure that nobody gets injured, in case it explodes,” he added. The reports say that at around 8:10 a.m. a woman went to the ATM machine of the bank to withdraw money. But she had noticed that a bag was on the floor, and nobody seems to be attending to it, according to the investigator. Meanwhile, at 11:30 a.m. today, Munez said that the bag contains personal items belonging to a woman whose identity is still unknown.